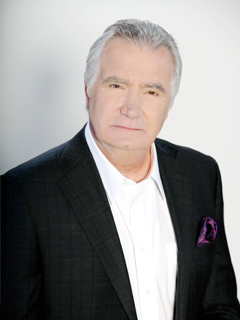 Thanks to myriad roles on stage, in film and on TV, John McCook has had the romantic leading man down pat for years, so it wasn’t a big leap for the California-born actor to create the suave fashion designer Eric Forrester on BOLD AND BEAUTIFUL in 1987. When he was discovered by legendary movie mogul Jack Warner (while starring in a revival of West Side Story in New York City), McCook was already making a name for himself in musical theater. He then became a contract player for Universal Studios until he was drafted by the Army; there, he played piano for the Soldier’s Chorus. Following his two-year military career, John starred in Barefoot in the Park with Virginia Mayo and Mame with Ann Miller. He was then cast as Lance Prentiss on YOUNG AND RESTLESS in 1975; he quickly became a fan favorite. McCook also continued his success on-stage with starring roles in Oklahoma!, The Pirates of Penzance, They’re Playing Our Song, Seven Brides for Seven Brothers, Fiddler on The Roof, Peter Pan and Man of La Mancha. He has performed opposite pal Carol Burnett in From The Top and Putting It Together. After leaving daytime in 1980, McCook guest-starred on numerous prime-time TV shows until Y&R Co-Creator William J. Bell was looking for a patriarchal charmer for his newest soap, B&B. Bell called upon McCook, but in their first face-to-face meeting, the soap exec was surprised by the actor’s undiminished youthful appearance. Would the audience accept him as the father of adult children? Some gray highlights did the trick, and 16 years later, the answer is a resounding yes! Sometimes went by the stage name John Damon. McCook's current wife is a former television actress best known for her role as Cassiopeia on BATTLESTAR GALACTICA. McCook received his first Daytime Emmy nomination, for Outstanding Lead Actor, in 2001. McCook's compact disc, John McCook Sings Bold & Beautiful Love Songs, reached the Top 20 in most leading European markets.